Cynthia Marsh Cook, I hope you’re reading this and that you’re seriously considering “getting over it” with me next year. For the first time in 30 years, I did the Cooper River Bridge Run/Walk with no kith or kin to swap war stories with in the park. It was still an awesomely amazing morning, but it would have been even more memorable with someone to share the event with. 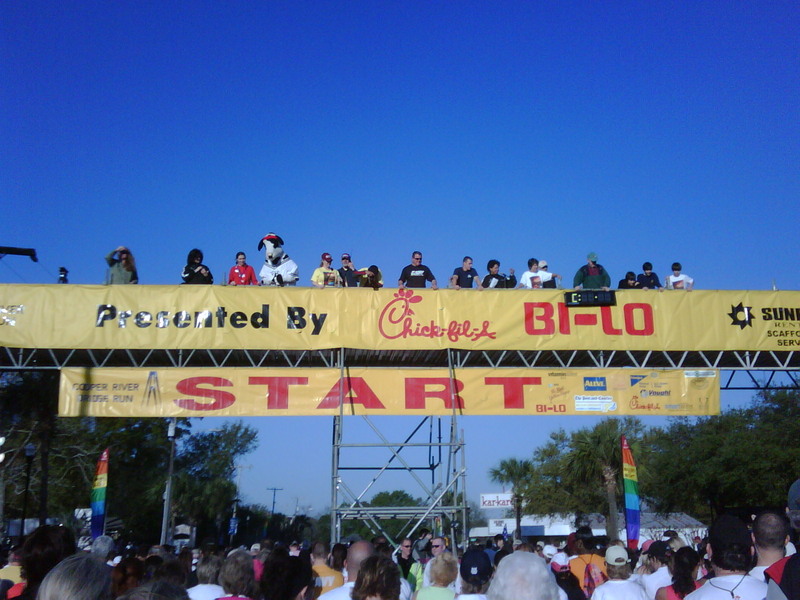 The first time I participated in the Cooper River Bridge Run, the race began at Patriot’s Point, and I could see every single person who was running with me. In those days, I was running and not walking, and the entrants were much fewer in number than Saturday. There were probably several hundred of us, but we were contained in one relatively small area. Today the sea of people stretches so far that you can’t see a beginning or an end. Another change is that I’ve slowed down quite a bit. As the years rolled by, the crowd grew larger, and there were times that we could feel the old bridge shake as hundreds of footfalls hit the pavement. I loved that old bridge! The beauty and majesty of it were awesome. It had what I often refer to as the “coolness factor.” But back to the story. Every year, the numbers swelled, and at some point in the early 1990’s, I realized that it was easy to get separated from one’s companion(s). One minute your party would be there, and the next they’d be far ahead, not to be seen again until the end. Eventually, the Grace Bridge was demolished, leaving the Pearman Bridge, and in the summer 2005 the Arthur Ravenel Bridge was dedicated and opened. It’s the one we now traverse, and I have to admit that it too has a definite coolness factor too. It doesn’t shake, it’s much wider, and the diamond twin towers are awesome. The only advantage the first bridge had was the wonderful sensation of soaring when you flew down the span. Of course, you had to work like the dickens to get to the top of them, but once the ascent had been laboriously made, well, the fast, fun descent was so amazing that I can’t find adequate words to describe it. Initial numbers of a few hundred grew to a few thousand, and Saturday there were nearly 30,000 people “getting over it.” From my vantage point, I could see neither beginning nor end. People were so densely packed around me that I could scarcely see to the side of the road, much less the start line. For the first time, we lined up in “waves” according to our projected finish time, and I was in Wave J, the next to the last one. Did that bother me? Not at all. I felt happy to be able to walk 6.2 miles, especially with my bum left knee. About the densely packed crowd, there were people of all ages, from babies being pushed by their parents to quite a few senior citizens. Truly, I spied hundreds who were older than yours truly, an encouraging observation. Speaking of doing the distance, I used to always finish in less than an hour. Always. Then one year (I think it was 1982), I crossed the finish line to see my disappointing time of 1:01:01. It was devastating . I haven’t seen Saturday’s time yet, but I think it was probably 1:30 or more. Do I care? Not at all. About a decade ago, I began to think of the annual event as just that: an event. It’s a day to get together with thousands of other like-minded individuals who are into fitness and fun and the celebration of life. Saturday was the first time ever that I’ve been on the bridge without a single family member being somewhere in the pack. The Chick-fil-A cows were there, a sight that always brings a smile to my face. There was even one on the Bridge itself, and I saw several people scoot over to give him a hug. People in zany costumes were there…loved that too. I think my favorite s were the men dressed in red dresses, one of whom had a beard. And this year there were more bands along the way; I especially loved the Bluesy Duo on King Street. Still, there was no kith or kin to swap war stories with in the park. My friend Lynn and her sister Pam were there somewhere in the crowd, but we missed each other in the mass of humanity. I munched on a bagel and an apple before catching a bus that took participants back to Mt. Pleasant, and while I enjoyed the happy banter of all the people around me, I missed my peeps (I hope my daughter Elizabeth will forgive me for using that expression). Maybe they’ll join me next year. Cynthia Marsh Cook, I hope you’re reading this and that you’re seriously considering “getting over it” with me in 2012. Thanks Friend. I miss you! I never did that race and now I am so far away.